Apollo's Hegemony Pregnenolone is a source of pregnenolone, an endogenous steroid that plays a unique role in the human body. Being a precursor to the majority of steroid hormones, pregnenolone promotes hormonal balance. Classified to neurosteroids, pregnenolone also has a beneficial effect on the functioning of the nervous system. In terms of hormonal balance, pregnenolone is the linking element of the cholesterol from which it is formed, with steroid hormones to which it can be transformed. Pregnenolone constitutes the foundation for testosterone, progesterone, cortisol or estrogens, which are essential for the proper functioning of the body. Despite its huge role in the endocrine system, unlike other hormonal agents, its supplementation is characterized by a relatively limited number of side effects. The safety of use of pregnenolone results from the way it is distributed in the system. It can be said that the body decides itself in which biochemical pathways pregnenolone is involved, adequately to its current needs. This promotes the maintenance of homeostasis and the optimal synthesis of all pregnenolone-derived hormones. Pregnenolone is synthesized in the human body, but the degree of its production can sometimes be insufficient. An intense lifestyle, a large number of stress stimuli or special periods in terms of hormones, such as period or menopause, may lead to a situation in which the natural supply of pregnenolone will be insufficient for the optimal functioning of the endocrine economy. Then, it may be helpful to supplement it. Replenishment of the systemic deposits of this steroid hormone allows optimal functioning of mechanisms regulating the hormonal balance of the body. Supplementation with pregnenolone is particularly recommended for people exposed to a large number of stress stimuli. They stimulate the adrenal glands to produce an increased amount of cortisol, which leads to the depletion of systemic pregnenolone deposits. This, in turn, may result in a cascade of changes in the secretion of other hormones, which may manifest itself in various ailments, usually such as notorious fatigue and decreased strength, both on a daily basis and in a training room. Although supplementation with pregnenolone will not optimize the level of cortisol induced by an intense lifestyle, its supplementation may significantly increase the tolerance of the body to such a situation. Pregnenolone is also recommended to women during periods of hormonal imbalance. It is indicated that it may alleviate the symptoms of premenstrual syndrome (PMS) and facilitate going through menopause. Pregnenolone does in a similar way to cortisol – it promotes the optimal secretion of hormones for which it is a precursor, preventing the symptoms resulting from their large fluctuations. This supplement can be also used by men. Deficiencies in pregnenolone may cause testosterone to drop. Therefore, it is worth considering taking it in case of reduced libido or chronic lack of energy. It is indicated that supplementation with pregnenolone may also be effective against inflammatory changes within the joints. The available study results indicate that its intake may reduce the intensity of characteristic symptoms, such as joint pain and stiffness. Pregnenolone’s activity is somewhat different within the nervous system, where it also shows a significant effect. As a neurosteroid, it exerts a strong influence on neuronal functions, both due to its action and to the compounds for which it is a precursor. It is the basis for the formation of two other key neurosteroids, pregnenolone sulphate and allopregnenolone. Due to its important role in the nervous system, pregnenolone supplementation positively affects the brain's function. It supports its functioning by improving cognitive functions. It facilitates focusing on the task performed and memorizing. It can also be a remedy for sleep problems -- it is indicated that its supplementation improves the quality of sleep, allowing you to sleep well without changing the duration of the night rest. Supplementation with pregnenolone also promotes neurogenesis. 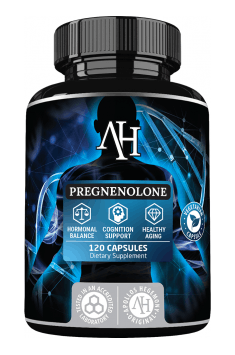 In summary, Apollo's Hegemony Pregnenolone is a supplement that provides an ingredient with an extremely important role for the functioning of the human endocrine system. It can be an effective remedy for fatigue, lack of energy, irritability, loss of libido, and a number of other symptoms resulting from disorders of the hormonal balance. It is intended particularly for those who lead an intense lifestyle and want to improve mental capabilities. Taking pregnenolone should also be considered by women during periods of hormonal imbalance and men experiencing symptoms of testosterone decrease. Take 1 capsule up to 5 times daily. Supplementation with pregnenolone should not last longer than 12 weeks. Pregnenolone should also not be used by people with diagnosed hormonal diseases without consulting a doctor. Simultaneous administration of pregnenolone and other hormonal agents, including contraceptives should be also consulted with a specialist. It is recommended to start with smaller doses and observe the body's reaction. It is indicated that increased physical activity reduces the risk of side effects, which most often are problems with falling asleep and anxiety. A multi-component preparation supporting the maintenance of health of bone and cardiovascular system. Odorless garlic in capsules. It regulates blood sugar, improves immunity, digestion and circulatory system.